Perfect Application--The exhaust hose fits to various portable air conditioner models. Portable,Durable & Flexible Air Exhaust Hose-- The Air Exhaust Hose is made of high quality polypropylene,which is a good replacement when the essential vent hose has cracked. Universal Size--The exhaust hose can be stretched and shrinked freely,the shortened length is 12.6 inch/ 32 cm, its can extend up to 59 inch/ 150 cm. Note--When installing, please rotate the hose anticlockwise to complete the installation. Warranty--24 Months Warranty,any questions,pls be free to contact us,we will reply in 24 hours. ENVIROMENTLY-FRIENDLY PP MATERIAL: Constructing from polypropylene,anti-corrosion, toxic-free. Flexible and durable air exhaust hose extension or replacement when the essential vent hose has cracked. STRETCH AND SHRINK FREELY: The air hose is designed extendable, the shortened length is about 20 inch/ 51 cm, extendable up to 78 inch/ 198 cm, stretch and shrink freely the length of the exhaust hose. 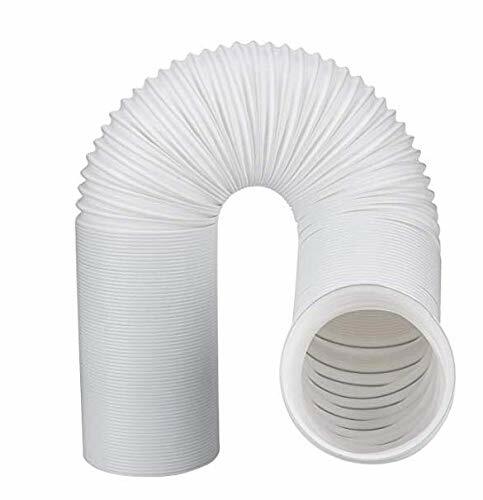 GOOD COMPATIBILITY: The diameter of exhaust hose is 5 inch/ 13 cm, fits to various portable air conditioner models, as long as its connector has 5 inch/ 13 cm in diameter. EASY TO INSTALL: Gently extend out the exhaust hose to meet up with the existing hose, line up with the both ends, snap into place. Just rotate the hose anticlockwise to complete the installation. NOTICE: Please check your air conditioner hose diameter before purchase exhaust hose replacement,make sure the diameter is 5 inch/ 13 cm (outer edge to outer edge). For more product information, please don`t hesitate to contact us. 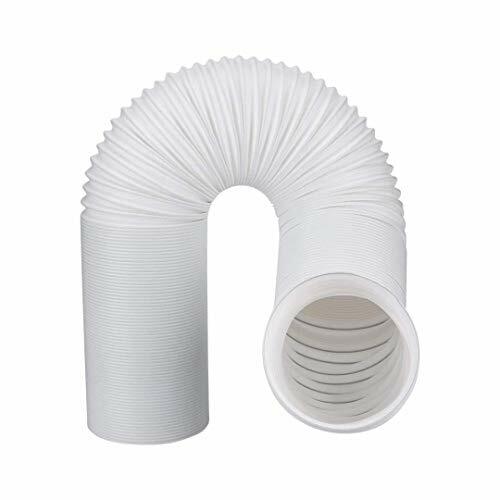 Durable and Portable: This air exhaust hose is made by environment friendly polypropylene with good flexible, which is a good replacement when the essential vent hose has cracked. Extra Long: This hose is extendable, extendable up to 79 inch/ 200 cm, stretch and shrink freely the length of the exhaust hose. Universal size: The hose diameter is 5 inch/ 13 cm (outer edge to outer edge), fits to various portable air conditioners using 5 inch diameter hose.Such as:Sharp pc-v10nc,LG lp1414shr ! COUNTER CLOCKWISE twisting direction! Easy to install: gently extend out the exhaust hose to meet up with the existing hose, line up with the both ends, snap into place, it's easy to install; When installing, please rotate the hose anticlockwise to complete the installation. IMPORTANT NOTE: The hose diameter is 5 inch/ 13 cm (outer edge to outer edge) ONLY FIT 5 INCH HOSE;Facing the hose,the installation direction is COUNTER CLOCKWISE, please check your air conditioner models before purchase to make sure the size is compatible! 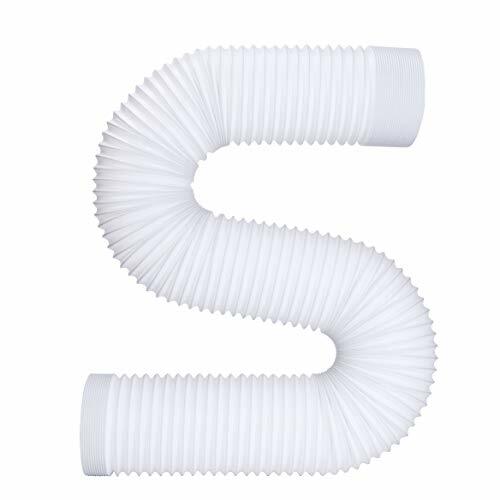 PREMIUM QUALITY MATERIAL: This air conditioning exhaust hose is made from superior quality, extra-durable polypropylene, guaranteed to withstand the test of time. 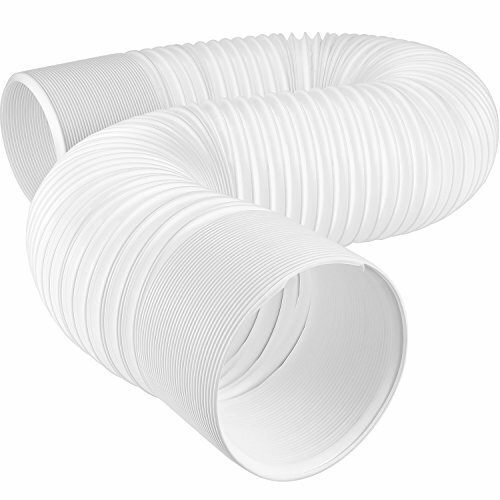 The material is extremely flexible, making it the perfect replacement for cracked vent hoses. 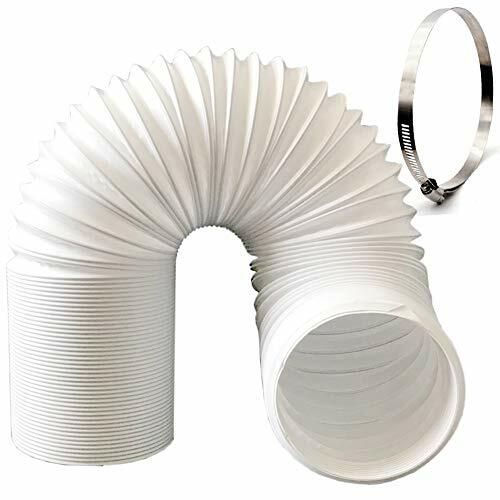 USER-FRIENDLY: With just a few easy steps and no required tools, you'll be able to connect this practical exhaust hose to the portable air conditioning unit. Simply align the two ends, snap into place and gently screw it counterclockwise, and you're done! 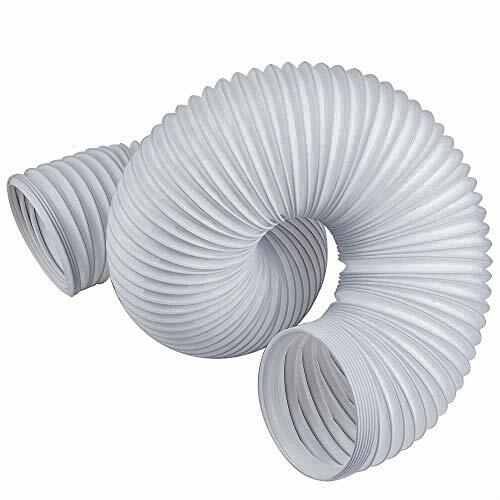 COMPATIBILITY: This flexible exhaust hose has a 5.9" or 15 cm diameter, meaning it's compatible with most standard portable air conditioning units. Be sure to check your size before ordering, in order to avoid size differences! 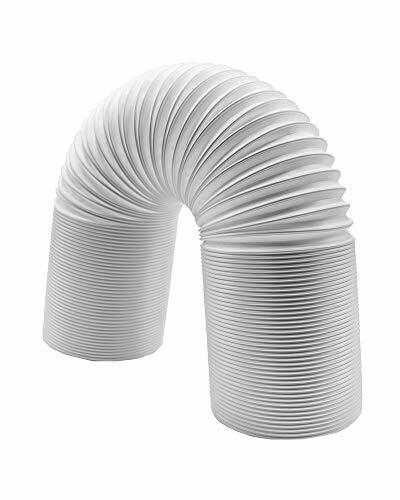 FLEXIBLE AND EXTENDABLE: The resistant polypropylene is not easy to crack and allows for the exhaust hose to expand from 11 to 59 inches long. This feature provides great flexibility and mobility for your portable air conditioning unit with no great efforts! SATISFACTION GUARANTEED: Order this practical exhaust hose and save up on your time, energy and money! If by some reason you're not fully satisfied with your purchase, our money back policy has got you covered! 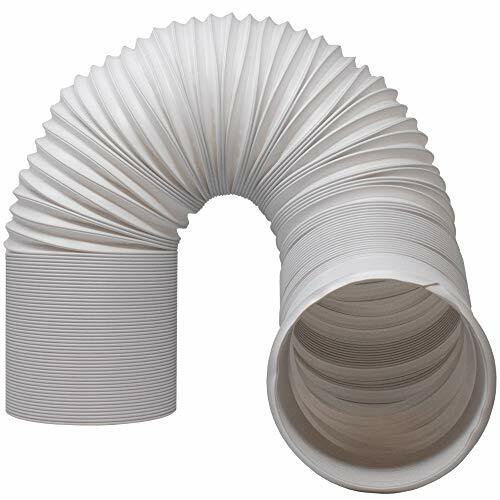 Made from high quality environmentally friendly polypropylene and reinforced with steel wire, this is a great replacement for when the essential vent hose has cracked. Stretch and shrink freely: The hose is extendable; the shortened length is 15 inches/ 38 cm and can freely extend up to 59 inches/ 150 cm. The threading is counterclockwise with an outer diameter of 5 inches (13 cm). Please make sure this size is compatible with your air conditioner unit before purchase. Easy to install. Just extend one of the ends and screw into your air conditioners exhaust opening. Turn the hose counterclockwise to tighten. Buy With Confidence. If you are not satisfied with your purchase, please feel free to contact us, we will give you a full refund at once. UNIVERSAL FIT: The hose has a 5 inch (13 cm) diameter which fits many portable air conditioners - make sure your AC unit requires a 5 inch diameter hose. 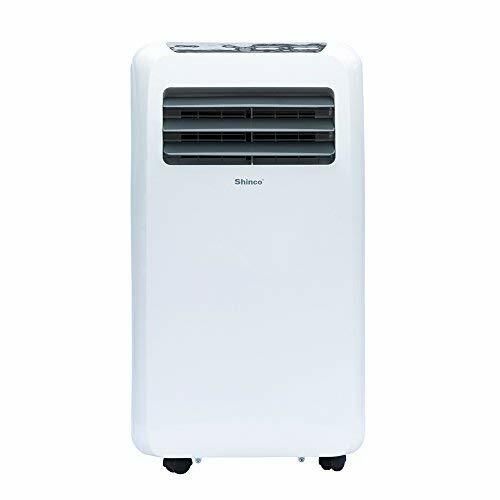 COMPATIBLE with DELONGHI, LG, HAIER, SAMSUNG, SHARP, HONEYWELL, and SOLEUS air conditioners. ENVIROMENTLY-FRIENDL MATERIAL: Constructed from polypropylene which is anti-corrosive toxic-free. STRETCH AND SHRINK FREELY: The air hose is designed extendable, the shortened length is about 14 inch/ 35 cm, extendable up to 79 inch/ 200 cm, stretch and shrink freely the length of the exhaust hose. 100% MONEY BACK GUARANTEE: If you don't absolutely love this replacement hose return it! No questions asked. FED UP OF YOUR SHORT AC HOSE? 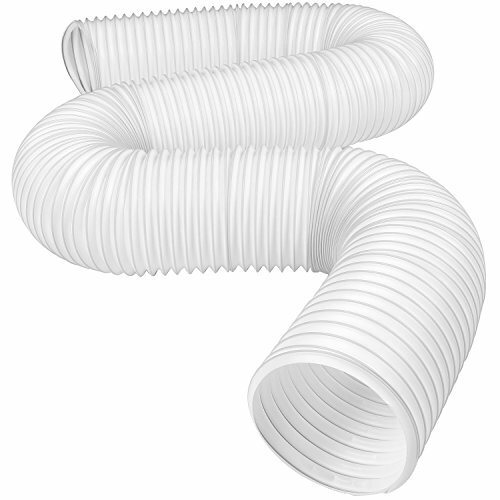 Move your portable ac unit freely around your room with our extra long indoor air conditioner exhaust hose. This hose measures 5.12'' (5 inch) diameter X 72" length. 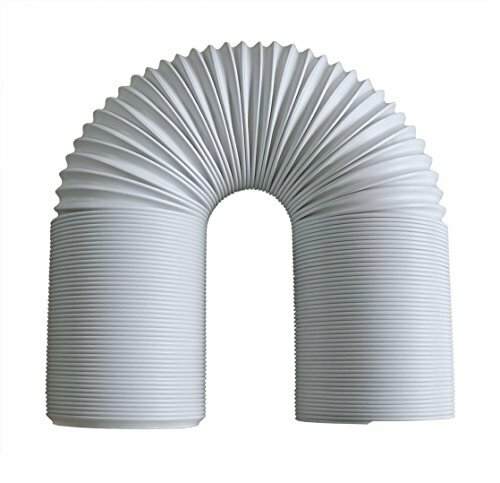 Flexible airconditioner vent hose / long portable ac duct for a floor ac unit. EASY TO ATTACH UNIVERSAL EXHAUST HOSE FITS MOST PORTABLE AIR CONDITIONER MODELS - All you need to do is measure your portable a c unit to ensure it has the same 5.12 inch (5'') diameter hose air outlet/exit point. We've also included an additional metal buckle included to allow clockwise & counterclockwise assembly. Attach with ease, just simply line it up & screw on. 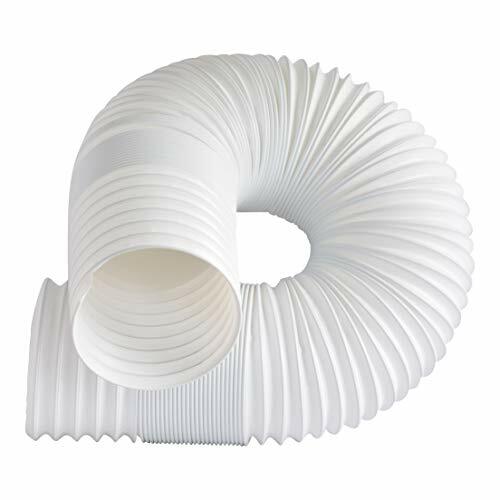 MADE FROM HIGH QUALITY, DURABLE, TEMPERATURE RESISTANT, ENERGY EFFICIENT, STRETCH & SHRINK, POLYPROPYLENE MATERIAL - Our ac vent hose enables hot air to be safely exhausted from back of the unit and vented outside via a window, wall or existing duct work. A truly flexible exhaust hose. 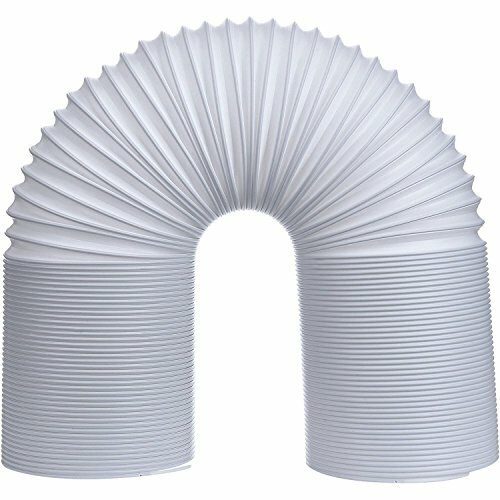 PLEASE MEASURE YOUR AC UNIT VENT BEFORE BUYING (IT SHOULD MEASURE 5.12 INCH OUTER EDGE TO OUTER EDGE) THIS VENT HOSE IS COMPATIBLE WITH MOST STANDARD 5'' INDOOR AIR CONDITIONER MAKES AND MODELS - LG portable ac exhaust hose, Delonghi air conditioner exhaust hose, Sharp air conditioner hose, LG air conditioner parts, honeywell portable air conditioners and more. Simply check the measurement on your AC unit. BUY WITH CONFIDENCE - We're a family run business who specialise in commercial and residential AC maintenance repair & parts. 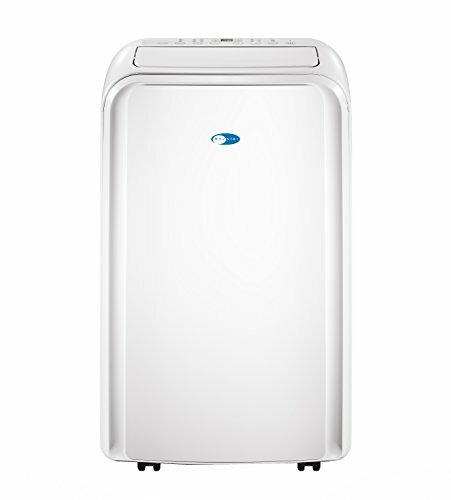 We also specialise in portable air conditioner accessories / portable air conditioner parts for a standing air conditioner / portable room air conditioner / portable air conditioners for rooms / indoor ac unit / portable air conditioner 14000 btu / portable air conditioner 10000 btu and various portable ac parts. 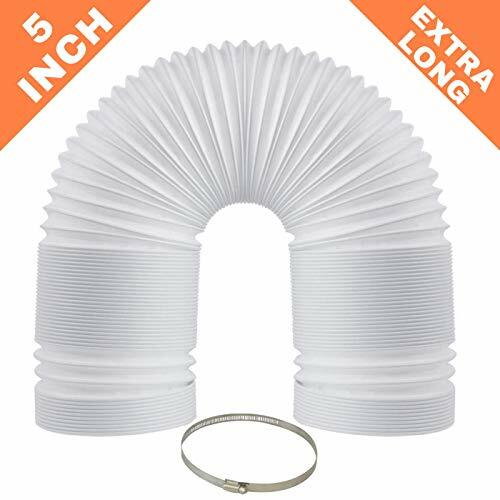 ✔️ Specifications - Your portable air conditioner exhaust hose has a 5.9 inch diameter, has flexible extension length up to 59 inches long, and has a counterclockwise screw-in direction to duct dryer attachment. Length adjusts comfortably between 12.6 inches and 59 inches. 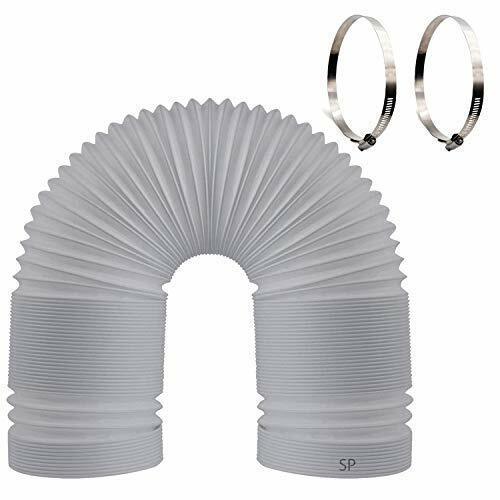 ✔️ Materials - Polypropylene air conditioner hose and stainless steel clamp. Both materials are designed for 10+ years of use and always come with a money back guarantee. ✔️ Easy Install - Simply screw air hose directly into air conditioner vent, or attach to an additional portable ac exhaust hose with a coupler for additional ac hose extension length beyond 59 inches. 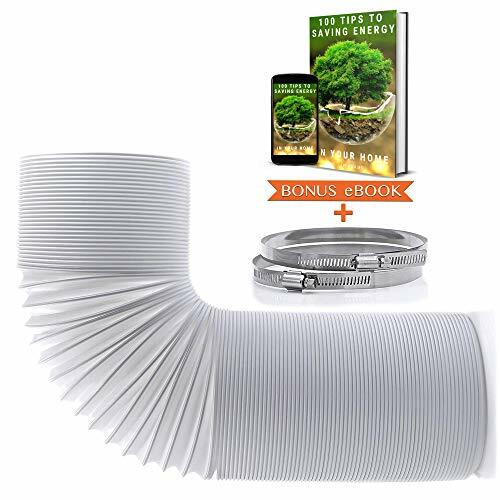 ✔️ Added Bonus - Your portable air conditioner hose comes with a free added stainless steel clamp to hold your air conditioner tube in place with ac unit. The clamp works for 5 inch exhaust hose or 6 inch exhaust hose. ✔️ Money Back Guarantee - Every purchase of a C-leo product comes with a lifetime money back guarantee. If for any reason you're not completely satisfied with your portable air conditioner vent hose, we'll buy it back from you, no questions asked. TOP QUALITY - Constructed from flexible and durable polypropylene that's built to last. DURABLE & LIGHTWEIGHT- Very sturdy and strong. The best replacement for your cracked or damaged factory hose. 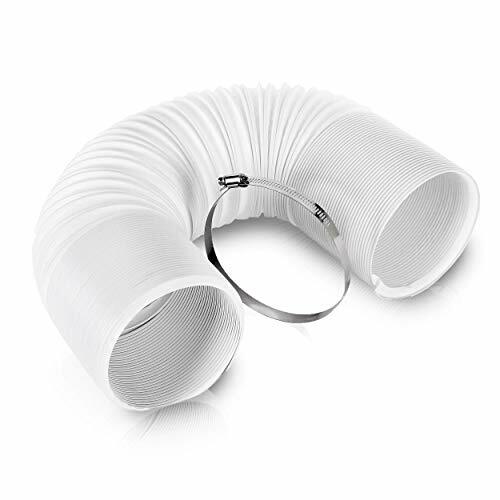 FIT - Exhaust hose fits several portable air conditioner models as long as you are using the correct diameter hose. Its connector measures 5 inch / 13cm in diameter and extendable up to 59 inch / 150cm. INSTALLATION - Gently extend the exhaust hose to meet up with the existing hose, line up both ends, snap into place. Fits COUNTER-CLOCKWISE thread. FAST DELIVERY & 100% MONEY BACK GUARANTEE! - If you aren't satisfied with your purchase, we will buy it back from you, no questions asked. GETS YOURS NOW! ✅ HIGHEST QUALITY: Manufactured from sturdy, yet flexible polypropylene. Very durable, environmentally friendly and non-toxic. ✅ UNIVERSAL COMPATIBILITY: The hose diameter is 5.9 inch / 15 cm (outer edge to outer edge) with a counterclockwise thread. 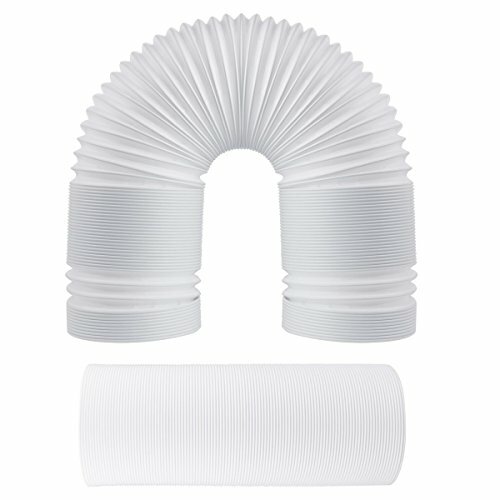 A perfect replacement for your old or damaged portable AC vent hose. 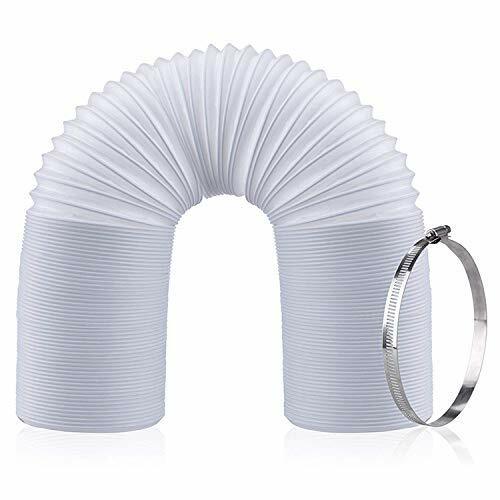 Fits most popular portable air conditioner models using a 5.9 inch diameter hose connector - no duct tape neccessary. ✅ QUICK & EASY INSTALL: The hose can extend easily from 12.2 up to 59 inches (31 to 150 cm). Simply select your perfect length, insert into the connector plug and rotate anti-clockwise to complete the installation. ✅ ATTENTION: Please make sure and double check if your portable AC model is compatible with the aforementioned size and installation direction. ✅ BUY WITH CONFIDENCE: Feel free to contact us if you experience any issues with our product. We are happy to issue you a full refund in case you are less than 100% satisfied with your purchase. ✅ DURABLE AND PORTABLE SOLUTION: Is your ac vent hose cracked? Replace your portable air conditioner exhaust hose with a long-lasting environmentally-friendly polypropylene hose. This hose kit is flexible and portable to be the solution for your venting needs. 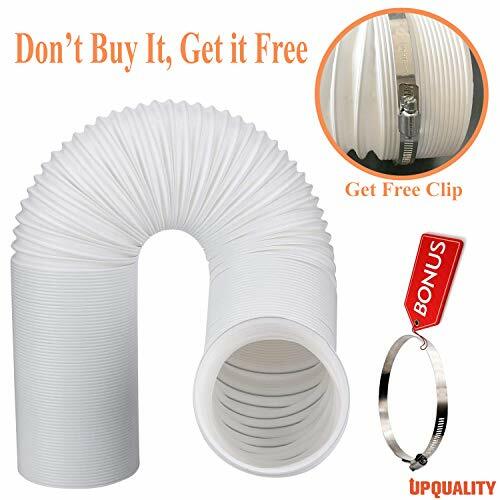 ✅ UNIVERSAL 5 INCH FIT: This vent hose will fit any portable air conditioner that has an exhaust vent diameter of 5 inches. 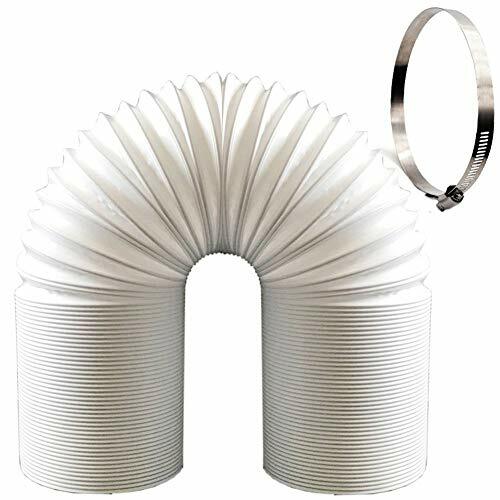 ✅ SIMPLE INSTALLATION: We have included a high quality stainless steel tension clamp as a AC window pipe vents Kit to make sure you have all the required materials for an easy installation. Simply remove old hose, insert new one over the vent and tighten the clamp! ✅ EXTRA LONG LENGTH: This exhaust hose is 59 inches long. This makes a perfect solution for all portable air conditioners HVAC replacement that fit the 5 inch diameter and allows you versatility and where you would like to place your unit. ✅ 30 DAY MONEY BACK GUARANTEE: Having an issue with your order? Reach out to us and we will honor a refund for up to 30 days after your purchase no questions asked! ✅ UNIVERSAL COMPATIBILITY: The hose diameter is 5.12 inch / 13 cm (outer edge to outer edge) with a counterclockwise thread. 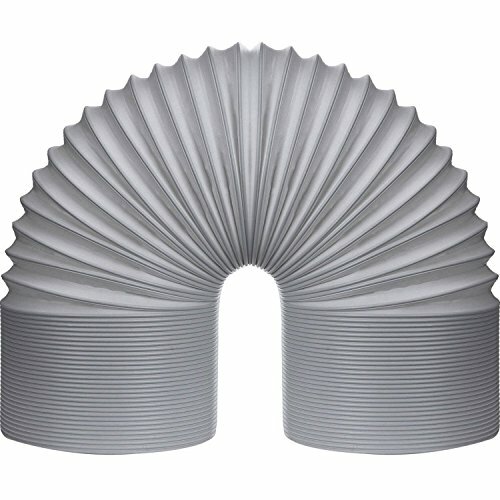 A perfect replacement for your old or damaged portable AC vent hose. 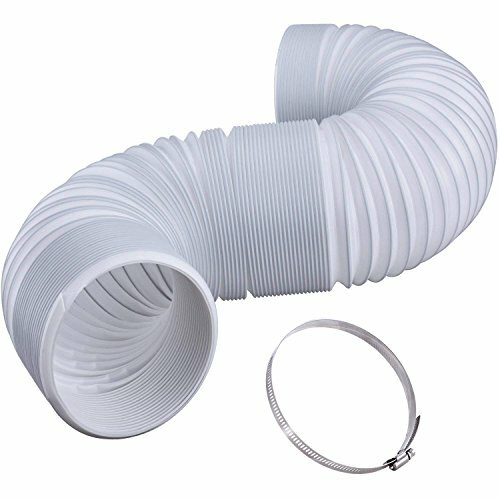 Fits most popular portable air conditioner models using a 5 inch diameter hose connector - no duct tape neccessary. ✅ QUICK & EASY INSTALL: The hose can extend easily from 12.6 up to 59 inches (32 to 150 cm). Simply select your perfect length, insert into the connector plug and rotate anti-clockwise to complete the installation. Buy With Confidence - If you are not satisfactory with GootoU's Air Conditioner Exhaust Hose, please feel free to contact us, we will give you full refund AT ONCE. 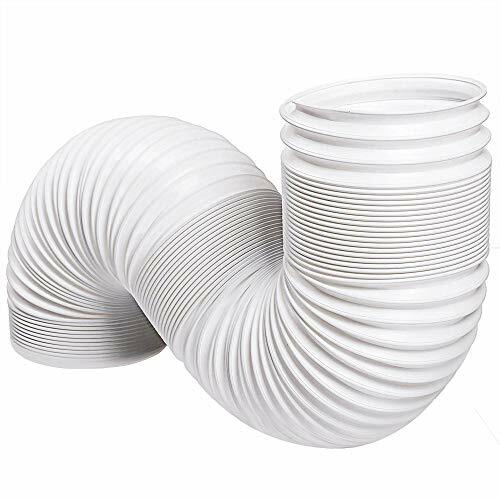 Exhaust Vent Hose Diameter is 5inch /13cm, The length can be stretched to 59 inch. Fits for various portable air conditioners using 5" diameter hose. 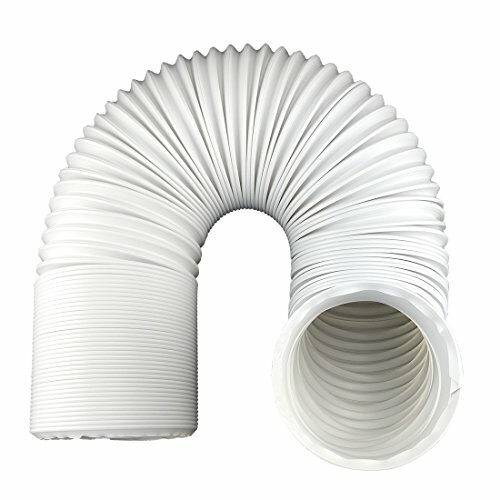 When Air Conditioner Exhaust Hose in use, gently extend the vent hose, connect the existing hose, align with both ends, and insert into position. Please check your air conditioner models before purchasing. The Exhaust Hose is Counterclockwise, and the package include the stainless steel buckle could tighten the hose. 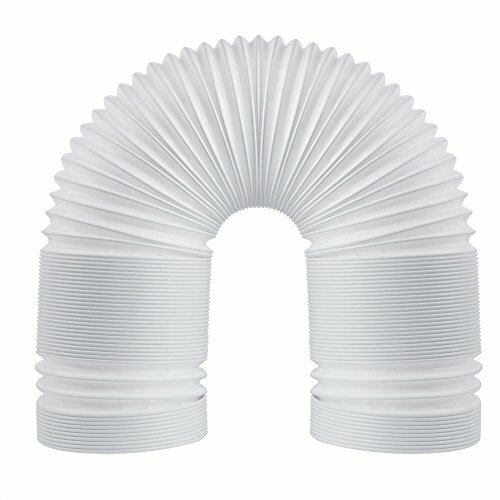 The Air Conditioner Exhaust Hose is made of polypropylene. Heavy Plastic is very good quality. 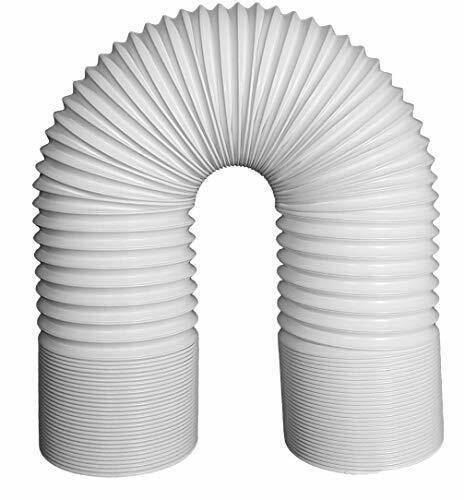 Air Conditioner Exhaust Hose can stretch up to 2,000 times. Durable and Portable - With high quality flexible polypropylene material, easy to install. This is a good replacement for various portable air conditioners using 5" diameter hose. ❄❄❄ POWERFUL REFRIGERATION CAPACITY - Compact 14,000 BTU Portable Air Conditioner Unit Delivers Fast, Effective Cooling for Spaces Up to 350 - 500 Sq.Perfectly Fit in Home, Office, Apartment,Cabin or party and etc. 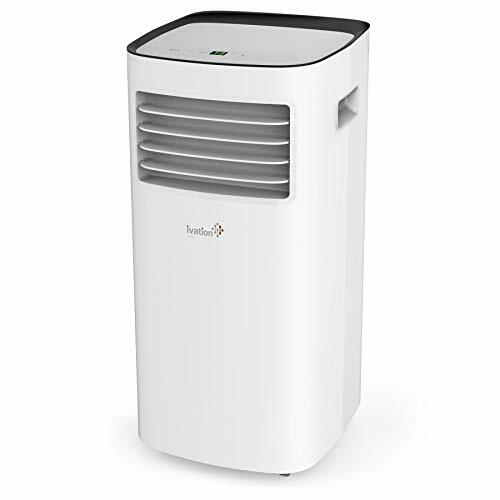 ❄❄❄ 4-IN-1 FUNCTION - Auto mode will select operating mode and wind speed based on detected ambient temperature; Air conditioner cools your room quickly, Heating Can be adjust Temperature Range From 17-32℃，Dehumidifier for humid days，keep your room cool and dry! 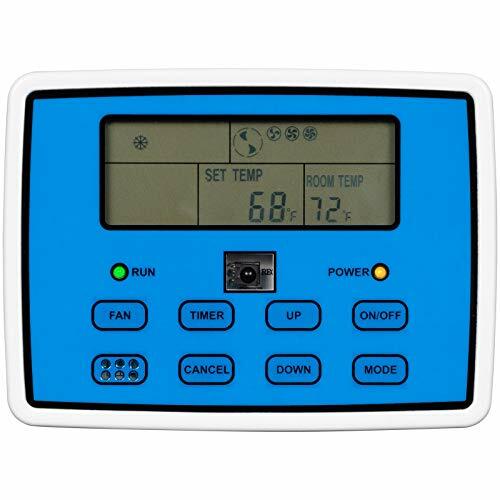 ❄❄❄ EASY TO USE -Digital LED display and Simple selections control panel,full-featured remote, 24-hr timer.fan(3 Speed Selesctable), 4 Mode (cooling,Heating,dehumidification,fan),Child Lock Safe Mode,Temperature, and Power Functions,Easy to Operate. ✅【KEEP-COOL】- Compact 12,000 BTU Unit Delivers Fast, Effective Cooling for Spaces Up to 400 Sq.Ft in Home, Office, Cabin or Camper. The air-outlet on the top blows vertically, helping to spread cool air wider and faster.When the room is cool enough, switch to the first speed level,this air conditioner will become quiet(Noise ≤52dB), enough to maintain the temperature while you are sleeping. Now you can easily control all of the functions and settings of your CR2500ACH, CR5000ACH or CR10000ACH from inside or from any nearby convenient location thanks to the Climate Right Wired Remote. 6' or 72" long Air Conditioner Exhaust Hose with 5 inch in diameter. 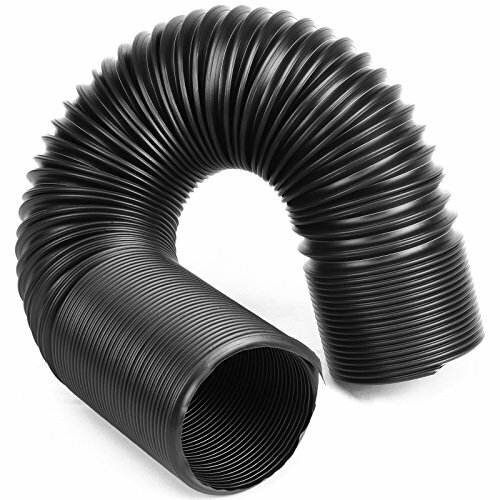 5" Portable AC pipe extends to 72 inch or 6 feet, a great replacement for shorter hose not long enough. Made of portable and flexible material, the pipe is 18 inch when shortened. Super easy to install, any handy person can install it within a minute. Make sure the diameter and length of this extension hose is compatible with you AC. 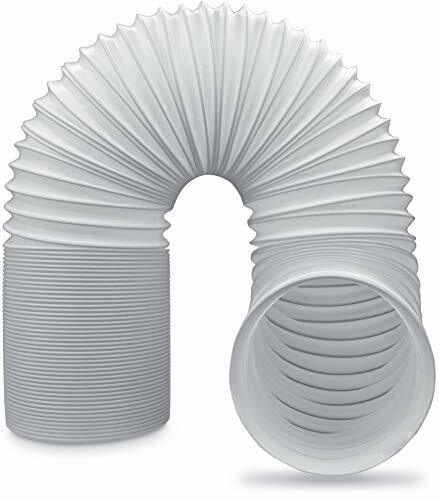 Universal AC Exhaust Hose - Designed with a 5" diameter and 78" length, these versatile air conditioning hoses can fit a wide range of compact, portable AC units. Counter-Clockwise Threads - These portable air conditioner exhaust hoses feature counter clockwise threading that helps it seal tight to ensure safe discharge. 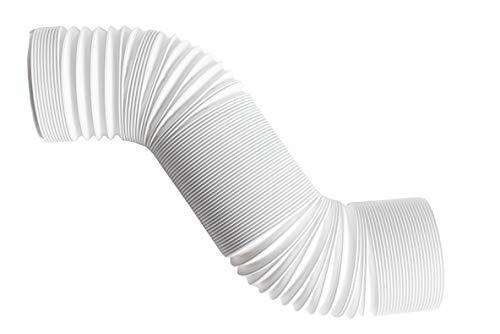 Long, Flexible Design - At 78" in length our AC exhaust hose can be extended or collapsed to give you the ideal length without leaving excess that takes up space. Heavy-Duty Polypropylene - A premium replacement hose for multiple portable air conditioner types, the durable, puncture-resistant material provides long-lasting use. Quick and Easy Installation - These hoses can be attached to your unit via a coupling piece and run up through a window in your home or office while creating a seal. Fits window with a maximum perimeter of 400 CM. 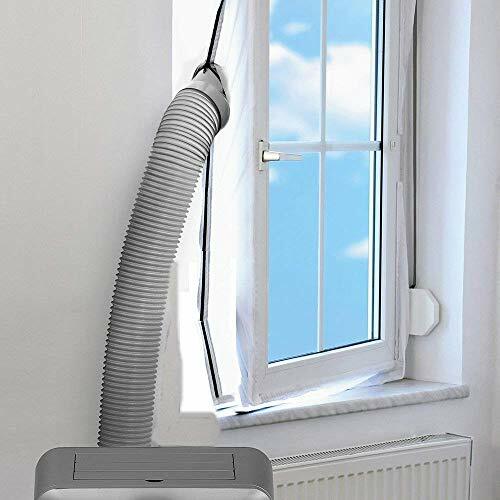 unIversal - Suitable for all portable air conditioners and tumble dryersregardless ,Whether for windows that open to the left or windows that open to the right, bottom hung windows or skylights,Window seal will do the job. 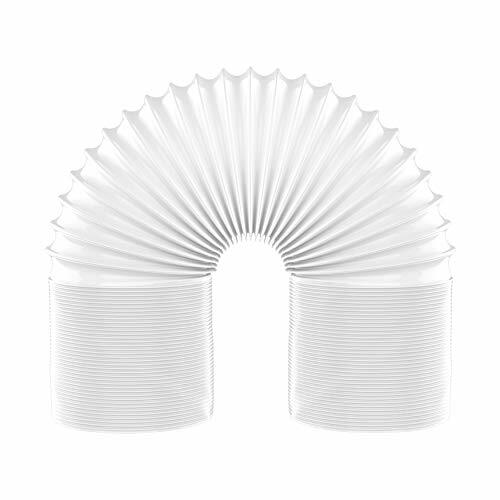 This window seal contributes to reduce energy consumption and to lower carbon dioxide emissions, which is particularly high in summer due to the massive use of air conditioning. Preventing warm air circulating in your room, window seal helps you save money on electrical bills! The fixing of the seal, made of durable nylon material on the Velcro surfaces on frame and sash is easy. The tube pushed through, the zipper closed and finished. The heat stays outside.Our window seal leaves out insects, mosquitoes, rain and crates a "closed environment" that keeps your room cool for longer. Easy to install, no need for drilling holes.Once installed between window and frame with only a few steps and the exhaust air hose end led outside through the hardly opened zip of the AirLock, this practical aid henceforth prevents the return flow of warm exhaust air into the room.Upon leaving the building the windows can be closed without difficulty. There is no need disassemble. Remote control, extendable exhaust hose (up to 59"), and upgraded plastic window kit (up to 48") included. Max. window kit length = 48" , Min. window kit length = 26.5"
✅ UNIVERSAL FIT: The 5-inch diameter of this AC exhaust hose is compatible with most AC window units on the market. This AC tube twists in a counter-clockwise direction. Unlike clockwise-threaded hoses that are clunky and hard to install, this hose snaps into place and rotates easily into your air-conditioning unit. ✅ EXTEND OR REPLACE: If your hose has worn out from use, use ours as an AC hose replacement. Or, if your current air conditioner hose is too short, use this one as an extension. ✅ FULLY FLEXIBLE: To meet the needs of your home or office, this 5" air conditioner hose extends to almost 5 feet, and contracts to little more than a foot. It is lightweight, adjustable, and customizable so that it can easily fit into any space. ✅ HIGH QUALITY: Our air conditioner exhaust hose is made of high-quality, durable materials. The polypropylene construction stands up to the wear and tear of regular movement without leaking. 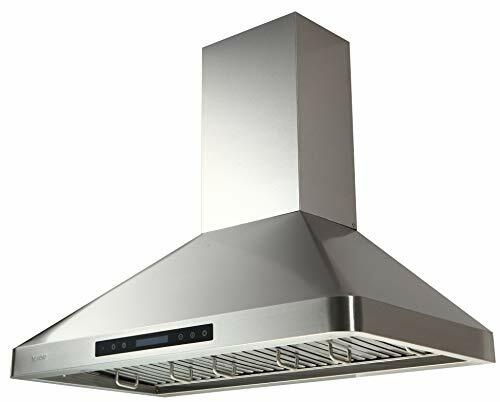 ✅ ENERGY SAVINGS: A well constructed AC vent tube and a reliable exhaust ventilation system increases the efficiency of all air-conditioning units, portable or not. Make sure that you're reaping the cost savings of efficient cooling with our heavy duty air conditioning hose. ✔️ LIFETIME WARRANTY- LOVE IT or we will buy them back from you, no questions asked. ✅【KEEP-COOL】- Compact 12,000 BTU Portable Air Conditioner Unit Delivers Fast, Effective Cooling for Spaces Up to 400 - 550 Sq.Ft in Home, Office, Cabin or Camper. When the room is cool enough, switch to the first speed level,this air conditioner will become quiet(Noise ≤52dB), enough to maintain the temperature while you are sleeping. ✅【MULTI-FUNCTION MODES】- 3 functions in one machine. Air conditioner cools your room quickly; 3-speed fan satisfies your needs. 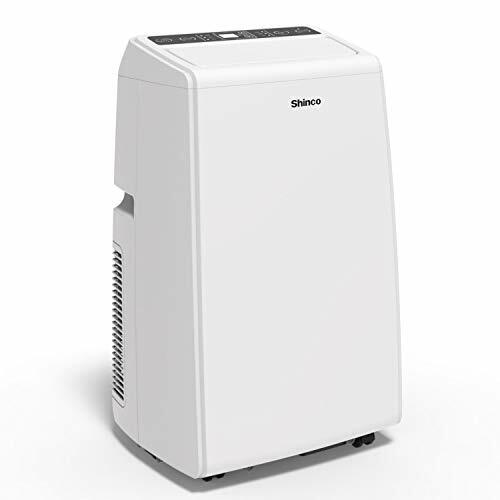 With 90 pint dehumidifying capacity per day, the dehumidifier function is a quick fix for stopping the growing of bacteria and mold in hot and humid environment, keep your room cool and dry! ✅【EASY-TO-USE】- LED display and simple selections control panel,full-featured remote, 24-hr timer, plus a quiet ＜52dB output on Low speed mode for disturbance-free nights.Four castors wheels make it easy to move from place to place, You can place it on bedroom, study, living room, kitchen, small office, RV, party and etc. ✅【QUICK INSTALLATION】- An exhaust hose and window kit is included, and no extra tools are needed for assembly. Installation instructions are simple, and can be done by anyone in 5-10 minutes. For any questions, please contact Shinco support at service@shincoglobal.com. We will respond within 24 hours. 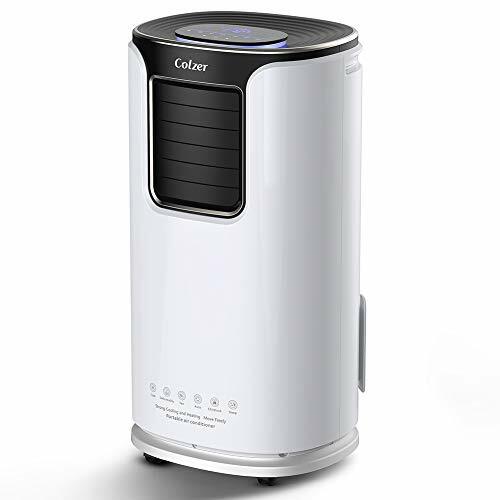 ✅【KEEP-COOL】- Compact 10,000 BTU Portable Air Conditioner Unit Delivers Fast, Effective Cooling for Spaces Up to 300 - 450 Sq.Ft in Home, Office, Cabin or Camper. When the room is cool enough, switch to the first speed level,this air conditioner will become quiet(Noise ≤52dB), enough to maintain the temperature while you are sleeping. ✅【MULTI-FUNCTION MODES】- 3 functions in one machine. Air conditioner cools your room quickly; 3-speed fan satisfies your needs. 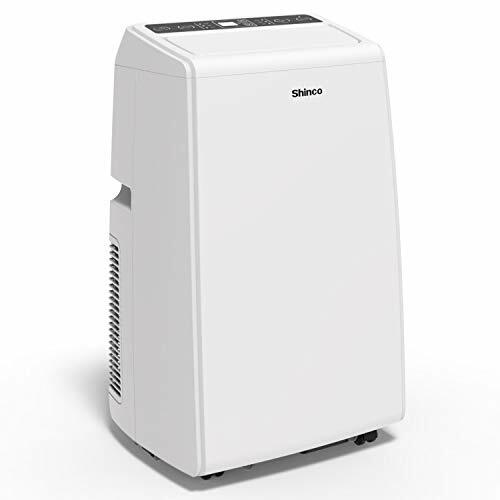 With 75 pint dehumidifying capacity per day, the dehumidifier function is a quick fix for stopping the growing of bacteria and mold in hot and humid environment, keep your room cool and dry! zero arrows Air Exhaust Hose 5 inch in Diameter and 59 inch Extendable. EASY TO INSTALL.Durable and Portable. Fits to any kind of Portable Air conditioner models as long as you are using same diameter 5 inch/13 cm. 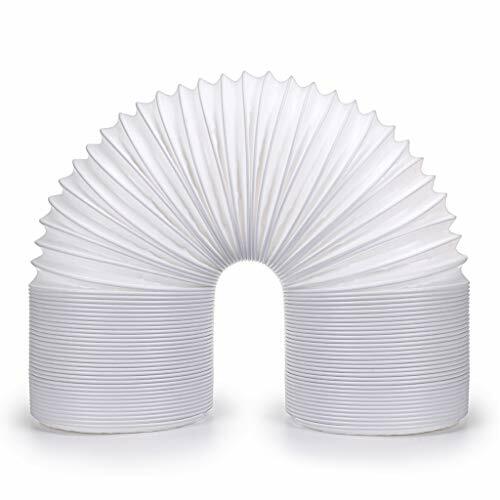 Made of Flexible Polypropylene and steel wire,good replacement when the vent is cracked. Heat resistance and Anti corrosion. Easy to extend up to 59 inch/150 cm.Counter Clockwise the thread of Exhaust hose. ✅【BEST OF BOTH WORLDS】- Keeps a room, home, bedroom, apartment, dorm or garage that is approximately 500 - 650 sq.ft room pleasant and comfy during the summer when the heat sets in. Also keeps a room that is approximately 300 - 450 sq.ft room warm in the winter. ✅ Extendable length. From 11"- 59" Easily extend to the perfect size! ✅ BONUS Clamp included for secure attachment to ensure your hose does not come off or break!